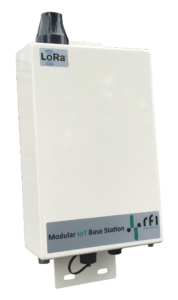 The L-gateway is a ruggedised modular outdoor gateway that enables versatile wireless connectivity to your Internet of Things (IoT) applications. The unit consists of a main processor board, running RFI Engineering's Linux based operating system, combined with a modular radio unit that can take up to 3 independent LPWA network radio's. Combine the outdoor gateway with a LoRa RF radio board to form a complete Outdoor gateway. LoRa RF technology has been pioneered by Semtech and is a 2-way wireless solution, operating in the license exempt ISM bands, that complements M2M cellular infrastructure. LoRa provides a low-cost way to connect battery operated and mobile devices to the network infrastructure. The function of the L-gateway is to forward received RF packets to an external server through a IP/UDP link. It also transmits RF packets that are sent by the external server. The L-gateway is standard equipped with one LoRa radio, a GPS receiver and an advanced modem. Optionally it can be expanded with two additional LoRa radio’s to turn the unit into a sectorized base station. The L-gateway has an external accessible RS-485 interface to allow easy configuration by an engineer on-site.